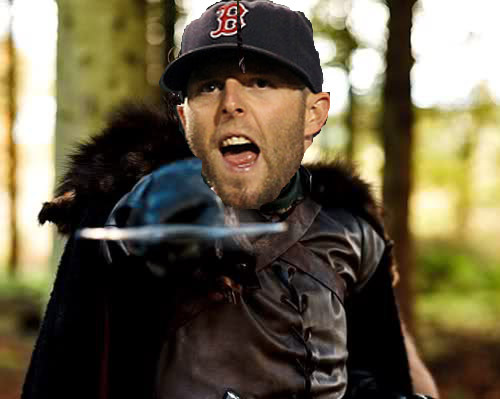 Robb Stark and Dustin Pedroia, aka Dustin Stark, aka Robb Pedroia, are compared to one another in this column by Write Fielder Andrew McGilligan. McGILLIGAN:At times, Fenway Park has seemed like a fictitious place full of dysfunction. Secret bands of players gathering to commit acts against the team (eat friend chicken, drinking and playing video games), a good man fired because of the antics of a few (Terry Francona) and others left to pick up the pieces and carry on after a disaster of epic proportions (2011 collapse). Yes it seems there’s enough dysfunction in Red Sox land that it should be part of Westeros, the mythical land in Game of Thrones. Sadly, there’s more than enough similarities that you can link players from the Red Sox past two seasons with characters from the hit HBO show. Some of the brightest minds in King’s Landing advise the King and help the King’s Hand navigate the rule of the city. At least that’s what they’re supposed to do. Instead, each one was plotting and scheming for personal gain or amusement resulting in the death of a good and noble man in Ned Stark. The trio of Lackey, Lester and Beckett were supposed to be the veteran core of a team that was favoured to win the World Series. The trio should have been helping guide the club and its younger pitchers (ie. Clay Buccholz and Daniel Bard). Instead they sabotaged the season with the chicken and beer escapades leading to one of the best managers in team history, Terry Francona, being fired. Stark nobly led Winterfell after going to war and winning several battles alongside King Robert Baratheon. The brutal politics and scheming in King’s Landing resulted in Stark being betrayed by those he trusted, imprisoned and ultimately death by execution. After leading the Red Sox to a pair of World Series victories alongside general manager Theo Epstein, Francona’s place as Boston’s manager should have been secure. However, the selfish antics of some players and the tuning out of his message by others resulted in an epic late-season collapse that must have felt like baseball prison and the ax ultimately fell on his job shortly after. After his father was executed by King Joffrey, Robb set out on a quest to avenge his father and take the Iron Throne away from Joffrey. His fierce nature in battle has earned him universal respect, even among his enemies such as Tywin Lannister, and a good nickname ‘The Young Wolf.’ He is the heart and moral compass of the show, willing to be in the middle of the battle amongst his men. Pedroia is the heart and soul of the Red Sox and one of its clubhouse leaders. He had a father-son type relationship with Francona and has publicly stated how much he owes his former manager for sticking with him. Pedroia plays hard every day, has the begrudging respect of his opponents and a great nickname in ‘Muddy Chicken.’ He’s even had some choice words for his current manager, the equivalent of mounting an attack on the King, after Bobby Valentine questioned veteran third baseman Kevin Youkilis. Amusing for about half a second in the first few episodes, no one wants Joffrey around anymore and every time he opens his mouth something stupid comes out (usually about his prowess with a sword). He can also be incredibly cruel. This kind of speaks for itself, but let’s explain anyway. His hiring was fine until the season started and the team sucked. Every time he speaks, he says odd things which can usually be classified as stupid or cruel or both (see Kevin Youkilis). Everyone is hoping his reign as manager is short lived. Clegan is massive and extremely adept at killing people. However, he receives little to no respect from his superiors or those in positions of power. In the ‘Blackwater’ episode he realizes the futility in what he does and how he will never be respected for it and lashes out saying screw the king and anyone else who wants to tell him what to do. Ortiz is just as frightening with a bat in his hands as Clegan is with a sword. Big Papi is massive and extremely adept at killing opposing pitching. Earlier this year – after being asked about a team meeting that was not made public – he lashed out saying despite all he’s done he gets no respect from management or the media. While its been a great run for Game of Thrones thus far, the same can’t be said for the Red Sox. The Fenway Faithful have endured countless indignities during the past two years (they know how Sansa feels) and at times it seems the only way out is a visit from that weird smoke monster.